Whether you need a healthy snack you can throw in your purse or something sweet to nibble on when your energy begins to run out, this seed and macadamia nut recipe will hit the spot. Not only are they simple to make, but they are perfect for your low carb ketogenic diet. You will love the mix of textures, hint of chocolate-y goodness, and of course the many health benefits. These macadamia nut bars are filled with healthy fats, low in net carbs, are a good source of dietary fiber, and energizing b vitamins. It’s amazing to think that one little tree nut can contain so many health benefits, but macadamia nuts pack a huge punch when it comes to nutrition. It is easy to overdo nut consumption on a ketogenic diet, but these bars offer just the right ratio of healthy fats, proteins, and are still low carb. You could use other types of nuts as well, but macadamia nuts are a nutritional powerhouse. In addition to the healthy fats and dietary fiber that macadamia nuts have to offer, these nuts are also rich in b vitamins which are essential for energy production. Vitamin B1(thiamine) helps to convert sugar/starch into the energy your bodies needs. Macadamia nuts are also rich in Vitamin B6 also helps convert protein to energy. B vitamins will also help with fat metabolism. Macadamia nuts are rich in essential fatty acids that are great for your heart. Monounsaturated fat can help reduce cholesterol levels, reduce blood pressure, and help keep arteries healthy. Regular macadamia nut consumption can help prevent the risk of cardiovascular disease. Macadamia nuts also help combat free radicals and oxidative stress that can lead to many chronic diseases. Compounds like copper, Vitamin B1, magnesium, and manganese found in these tree nuts help to keep neurotransmitters healthy. They also contain palmitoleic acid which helps protect nerve cells in the brain. These nutrients are vital for your nervous system. Keeping your nut consumption on a keto diet may be difficult for some, but just a small serving of these chocolate macadamia nut and seed bars will hit the spot. A little goes a long way with this recipe. Store these bars in an airtight container for up to two weeks and they will come to the rescue when that energy dips a bit and your pesky sweet tooth needs to be tamed. 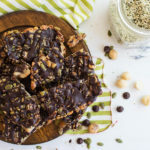 These decadent chocolate nut and seed bars are full of energizing healthy fats, protein packed ingredients, easy to make, and absolutely delicious. Preheat the oven to 350 degrees F, and line an 9×9 inch baking dish with parchment paper. Add all nuts and seeds to a large bowl and stir to combine. Melt butter/coconut oil with vanilla extract and syrup in a small pan set over low heat. Pour mixture over nuts and seeds and toss to coat. Taste mixture and adjust sweetness to taste if needed. Pour the nut mixture out into prepared baking dish. Use a piece of wax paper to press the mixture firmly together. Bake the nut bars for approximately 22-25 minutes until the top is golden brown. Allow the nut bars to cool for at least 45 minutes in the pan. Melt chocolate and 1/2 teaspoon of coconut oil in the microwave or stovetop. Drizzle onto bars. Place in the freezer for 10-15 minutes. Lift bars out of pan and cut into pieces.